Percy Sledge was an American soul singer. 1966 had seen Percy Sledge's career launched by his debut single "When A Man Loves A Woman", a #1 cross-over hit which also helped break the Southern Soul sound to a much wider national audience, and alerted the music business to the sounds coming out of Muscle Shoals. 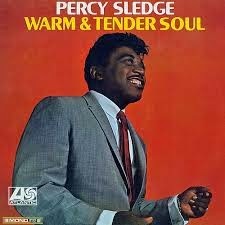 Still recording at Quin Ivy's Norala studio, Sledge's next single was "Warm And Tender Love" (originally recorded and released by Joe Haywood in 1964), which charted at #5 R&B and #17 Pop. A second album was quickly put together to capitalize on its success, mostly consisting of cover songs. These included Don Covay's "I'm Hanging Up My Heart for You" (originally a hit for Solomon Burke), Smokey Robinson's "You've Really Got A Hold On Me", Roosevelt Jamison's "That's How Strong My Love Is", Jerry Butler's "I Stand Accused", Jerry Goffin and Carole King's "So Much Love", and even Elvis Presley's "Love Me Tender". It also featured an arrangement of "Try A Little Tenderness", quite different to the famous Otis Redding version (they were both recorded at about the same time, so Redding's version was probably not yet known at Norala). Despite its reliance on covers, the album was strong, some excellent country-soul done the Percy Sledge way. The one standout original song was "It Tears Me Up", written by Dan Penn and Spooner Oldham, a moody country-soul classic. It became Sledge's third hit when released as a single, charting at #7 R&B and #20 Pop. "Love Me Tender" was also released as a single later on in 1967 and managed to creep into the Top 40.